Starbucks most popular coffee, this is a versatile, complex blend, combining great Latin American and Asia Pacific coffees with a touch of Italian Roast. Great in a coffee press, drip brewer or even as espresso. More about this coffee: Every Starbucks barista receives a pound of coffee every week, and Caffe Verona has been our baristas' favorite for many years. 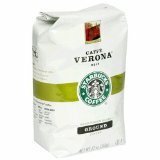 Decaf Caffe Verona features a sweetness and slight smokiness creating a deep, rich blend to be enjoyed any time of day. Decaf Caffe Verona is the perfect dessert coffee. Eighteen 2.5-oz. packs per box; blended Caffé Verona, the ideal after-dinner coffee. The crisp acidity of the medium-bodied Latin American coffees is grounded with the earthy flavor of the Indonesian coffees. A sweetness gilds the coffee's slight smokiness - creating a deep, rich dessert coffee. Each convenient portion pack is pre-measured to brew one perfect pot of coffee - no guessing, no mess. One portion pack is filled with 2.5-oz. of ground Caffé Verona coffee. There are eighteen portion packs per box. Starbucks Trivia: Beginning March 3rd Starbucks will begin offering a combo of a Latte with either a piece of coffee cake or oatmeal. This combo will be offered for a low price of $3.95.